In 1971, Bobby Murcer hit .331 with a .427 on-base percentage. He was the most effective offensive performer in the league, evidenced by the statistical measure that best adjusts for league and park conditions, OPS+; Murcer posted a league-high 181 in that category. He also manned one of the game’s most important defensive positions, centerfield, and presumably did so at a level close to that which would earn him a Gold Glove the following season. Despite all these accomplishments, Murcer finished seventh in the MVP voting. The player directly in front of him in sixth place in the voting, Freddie Patek, hit .267 with a .323 on-base percentage and six home runs. Patek did play one of the only positions on the field arguably more important than centerfield, but he didn’t win a Gold Glove at that position in 1971 or in any other year. So how did voters determine that he was more valuable to his team than Bobby Murcer? Well, I wasn’t old enough to be paying attention in 1971, but I do know that when I did get old enough to know who Freddie Patek was, I associated him with one thing, his size. More specifically, as a baseball fan I absorbed and reflected the prevailing attitude of faintly patronizing awe and admiration toward Freddie Patek. Little Freddie Patek! Not even tall enough to ride the carnival rides! But still out there bravely turning double plays with the likes of Don Baylor and Reggie Jackson hurling their hulking frames at the second base bag! And if the guy performing well on the visible level (which also includes the even more dubious or at least impossible to measure value of, for example “being fiery” or “being a good teammate”) is 5’4″ tall (as Freddie Patek is listed as being on the back of this 1978 card), then the applause will have an added spark to it. Call it happiness. I mean, let’s face it, it’s just fun to watch a little guy mix it up out there with the hulking behemoths. I know I certainly always liked Freddie Patek. And now, similarly, I find myself drawn to Dustin Pedroia. (In fact, earlier this year I talked about him so much that my wife accused me of being in love with him.) I was thrilled when I heard yesterday that Pedroia had been awarded the A.L. MVP. As a Red Sox fan, I followed the team closely this year, and he certainly seemed to contribute a daily spark that the often injury- and controversy-beleaguered team would have been lost and joyless without. Beyond his excellence in the “visible” realm as a fiery double-smashing, base-stealing, dirty-uniformed little guy, he also had inarguably good offensive numbers, and impressed enough observers with his fielding to win a Gold Glove at a very important position. But was he more valuable than his teammate Kevin Youkilis? It’s an interesting question, and one Tony Massoratti does a great job of exploring in today’s Boston Globe. Ironicially, Freddie Patek was features on an episode of “Cheat Seats” that took a new look at the 1978 “Superteams” competition between Patek’s Kansas City Royals and the Dallas Cowboys. Near the end, Keith Jackson interviews Freddie (see transcript below). Sklar bro: (in Keith Jackson voice): You get three wishes. Sklar bro: Wish for more wishes, Keith. Wish for more wishes! Sklar bro: (in leprechaun voice) Stay away from me gold, Jackson. 2. Someone actually left Pedroia totally off the ballot. 3. 1971 was my age 10 season. I was always the smallest boy in my class in school and so the little guys in the big sports were amongst my idols. Freddie Patek was one of them, as were guys like WR Harold Jackson of my L.A. Rams. If I were growing up today, I’m sure I’d be rooting for guys like Dustin Pedroia and, yes, David Eckstein. 4. As another vertically challenged person — and one who has spent his share of time mixing it up with hulking behemoths — I always root for the undersized as well, especially after my ninth-grade gym teacher said I was better than several people he was picking for the JV basketball team but it didn’t look right to pick me ahead of them. I’ll never forget the classic image of Patek crying alone in the dugout after Chris Chambliss’s famous blast. 5. 4 : I haven’t seen that image, only knowing the Chambliss homer for the chaos on the field. It’s doubly poignant because Patek, who in many ways epitomized the great 1970s Royals, was the most notable absence on the 1980 team that finally beat the Yankees. (By then he was wrapping things up with the Angels, replaced by U.L. Washington.) I kind of hate it when a long-time key member of a team leaves just before that team finally makes a big breakthrough. 6. Patek also helped lead a 3rd-year expansion team to a winning record and 2nd place in their division in ’71. No team had ever done that before. Also, Patek did not sit and cry in the dugout after Chamliss’ HR. That was in ’76, in New York. 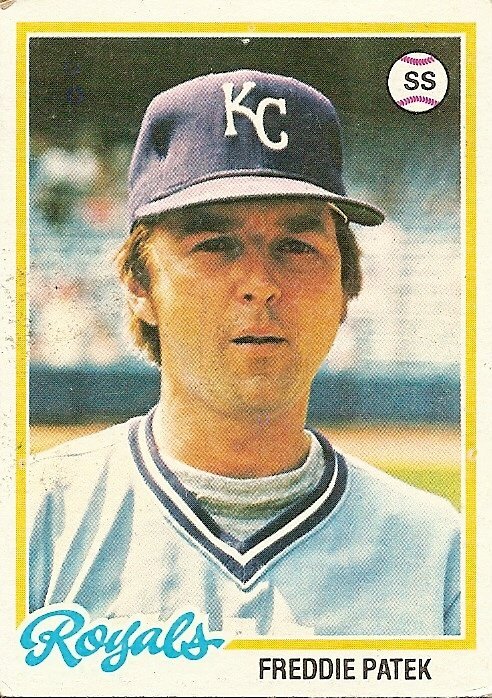 He sat in the Royals dugout in Royals Stadium in ’77 after making an error in the top to the 9th to give the Yankees a lead, then grounding into a double play in the bottom of the ninth to end the game and the series. Rangers fans need apply to the position of Professor of Royals History. Royal fans can take care of that. 7. I was very interested in this card ’78 card because everybody knew Patek (because, obviously, of his size) and because he was one of the Royals who most stood diametrically opposed to my Red Sox at the time. You couldn’t mention Patek except in relation to his height. Then he hit two homers in one game at Fenway (in 1980, I think, when he was with the Angels) and it seemed like the world was upside down. Most interesting to me in this entry by Josh, however, are numbers on Bobby Murcer. I always have an image of him in my head as a disappointment, but there is his 181 OPS+. 7 : Not sure if you meant to do this, but if so, thanks for the gentle nudge to fix the misidentification of Patek’s card as being from ’77; I changed the reference to the card to the correct year. Yeah, Murcer had his moments. If he’d played in a hitter’s era he might be considered on the cusp of Cooperstown. 9. 7 You’re right, except it was THREE HRs (and a double) – Patek’s only multi-HR game in his career. That was a great day for us little guys. 10. 9 : I was just about to confirm my memory that Freddie’s big day included 3 dingers, so thanks very much for posting that. An amazing deviation from the norm, as if Steve Balboni had a day with three stolen bases and a couple triples. Yeah, Nomar would certainly qualify, but it’s weird, I’m usually more disturbed by the guys-leaving-just-before-nirvana thing when I notice it in the baseball encyclopedia. Living through it at close range (figuratively), I can’t say I allowed Nomar’s absence to lend a bittersweet air to the joy at the end of that season. But if I ever had the chance to cheer him (say at a “welcome back” ceremony some years on) I’d cheer him as if he was on that field for the last out in ’04; he deserves it (and in fact I’m pretty sure he was voted a full playoff share). 11. I was also accused of be a Pedrioa lover by my wife this year. But, come on, what’s there not to love? He does absolutely everything on the field and is a cocky little bulldog that talks a little trash and riles up the Sox. I was so happy to see him get that trophy. I hope the Sox can hold onto him for a long time. 12. 11 what’s there not to love? 13. A couple of years ago, I saw Patek with a couple of grandkids either in a picture or on TV. He was balding and his remaining hair was gray. It made me feel old. 14. I was gonna say…I don’t think any Royals sat in the dugout after the Chambliss game. Even Yankee players were running for their lives. As for the photo–definite Yankee Stadium, blue padded wall; horizontal metal railings in box seats; then just blue with metal seat numbers reflecting above those; classic sun/shade line a little over halfway up lower deck. I’d say 7/24/77, only day game they played at YS that year (other than an August make-up game–I wouldn’t think Topps photogs would be on hand for that). If it was that game, Patek would go 0 for 3 but walk and score KC’s only run in a 3-1 loss. The Yankees had already taken the lead when Brett’s error allowed an insurance run. If memory serves, the announcers were theorizing that Patek was particularly upset because he knew it was to be Cookie Rojas’s last game and Rojas had never made it to the World Series. Even as a jubilant 8-yr. old Yankee fan, I felt bad for Patek. I think you’re right Josh (re: tomorrow’s D. Kingman post) that I wouldn’t have felt as bad if he had been 6’6. 17. Yep, even before reading the entry and comments, the two things I automatically recalled about Patek upon seeing the graven image of KC’s Short-stop were his diminutive size, and his weeping when the Yankees won the pennant. I too always liked Freddie Patek. As to leaving a team before they finally win thingy, although a different sport, I always thought that way of George Blanda, who retired after 1975 when he was 48. The Raiders won the Super Bowl the next season with a terrible kicker (at least in ’76 he was)–Errol Mann.